Love is in the air as we slink into February in Kotaku's official forum, and what do you folks love? That's right, video games. In fact you even love talking about video games, so here we are. A brand new month brings with it a brand new TAY image, this time discovered via a site suggestion from frequent TAYpiccer Pand1a7. 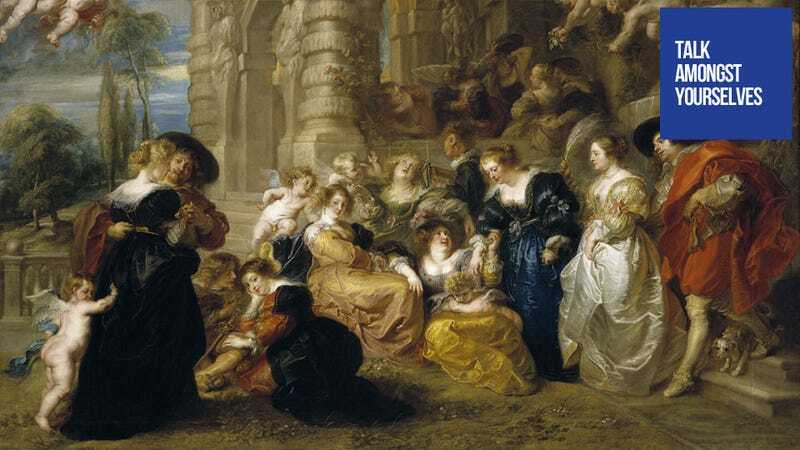 In celebration of this lovely month we present Rubens' "El Jardín del Amor". Love is in the air in the work, along with other things I won't mention — you'll just have to see the full non-cropped version for yourself. It's the cropped version we're interested in, however. Surely this picture is ripe with elements perfect for transforming through the miracle of Photoshop into video game-themed greatness. You know the drill, folks. Please do your best—or your worst—and share your own riffs on our February image to our #TAYpics thread. Just remember to keep your image in a 16x9 ratio and you just might see it featured atop a future installment of Talk Amongst Yourselves. Grab the base image here. The best ones will be featured in future installments of Talk Amongst Yourselves.